I have always had fine, limp hair to begin with so it's always been my frustration to have thicker hair. My diabetes and hormones aggravated my hair woes and I've been losing a lot of hair lately not to mention that I can't skip having my hair rebonded every year.. Believe it or not., that's all of it. I've tried a lot of hair thickening products in the past but I haven't found one that delivers consistent results. Three weeks ago, I was sent a pack of Novuhair Topical Scalp Lotion and Herbal Shampoo to try out. It was timely, actually, because I just had my hair rebonded again and my hair needed extra loving care after the tedious hair treatment. 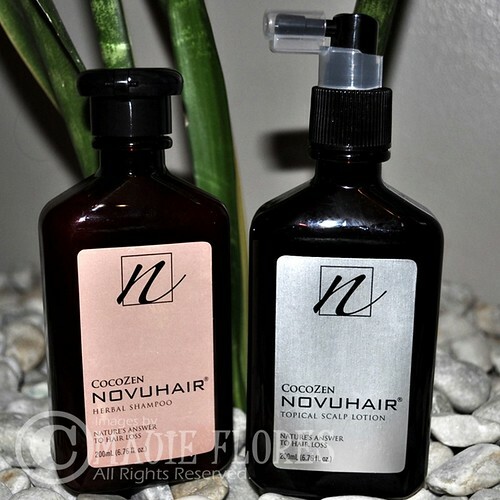 Novuhair shampoo and topical scalp lotion. Zingiber officinale - Increases blood circulation in the scalp and has antiseptic and anti-inflammatory properties. Moringa oleifera - Contains thicyanate that helps prevent falling hair. Panax ginseng - Stimulates hair growth and prevents falling hair. Centella asiatica - Naturally promotes hair growth by counteracting free radicals that affect the hair and scalp. Biotin - The hair and nail B-vitamin. Phylantus emblica - Has rich tannins that prevent gray hair. Dexapanthenol (Vitamin B-5) - Prevents hair loss and hair graying. Aloe barbadensis - Stimulates hair production and fights androgenetic alopecia (male pattern baldness). Virgin coconut oil - Controls dandruff, moisturizes scalp, and brings out healthy hair. Peppermint - Relieves scalp itching therefore preventing one from scratching it and cause damage to the hair. Lemongrass - Helps keep the scalp pores clean and the hair healthy. Rosemary and Lavender - Stimulates hair growth, disinfect the scalp, increase blood circulation, and improve hair health. Novuhair Shampoo is to be used as replacement to your usual shampoo. It's gentle enough to use everyday since the ingredients are all natural. You can even use it twice should you like to wash your hair before sleeping at night. 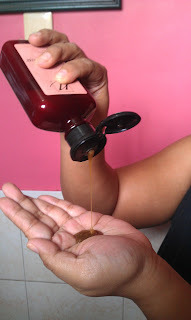 However, like other organic shampoos I have used in the past, Novuhair Shampoo tends to make the hair a bit tough and hard to comb so I still condition my hair (except the part near the scalp). In the morning after I shampoo, I towel dry my hair and spray Novuhair Topical Scalp Lotion on my scalp. Then I massage it for 5 minutes (better when done for 10 minutes) and rinse it again before I style my hair. At night, I spray Novuhair Topical Scalp Lotion again but I leave it on for the night to have it penetrate my hair follicles more. I've been using Novuhair Shampoo and Novuhair Topical Scalp Lotion since the day the package arrived. So far, I noticed less hair fall and hair breakage. I have also seen short strands of hair growing on my scalp. Hopefully, I'll see more improvement in the next three weeks. Novuhair Shampoo and Novuhair Topical Scalp Lotion is exclusively marketed by Nutramedica and is available at Mercury Drug stores. For more information about the product, please visit www.novuhair.com or call their hotline numbers: 0922.8830575, 775.8368, or 413-6570. You can also follow Novuhair Offcial on Facebook to be updated on their latest promos and the schedule of their free hair and scalp analysis. Let us know again your progress after using the product many times. i have heard a of good things about Novuhair + i am really quite interested to try it out. i have been having problems with hair loss + i'd like to put a stop to it while i still have hair. i'll see if it improves after i get a haircut, otherwise, i guess am gonna have to use this product! This will be a great help for those people suffering from hair loss. unfortunately, i am also losing my hair, i noticed it few days ago while taking my shower, I lost hair more than i usually lost before, I hope i can find a good shampoo or treatment to stop this. I should have that shampoo, my hair shed so much that sometimes, I wonder if i will go bald before I reach 50. Yaiks! This is just the first time I came across with this brand . Hair loss is a major problem of older individuals and moms who just gave birth. I'll check this brand when we shop this weekend. Sounds like a good product to try. My MIL has been experiencing hairloss now as she ages and is looking for a treatment for it. I should recommend her this product! I have never really heard of this product before, but I am glad it is working for you. Sorry about the hair loss or falling thing. Thanks for sharing this one. My mother uses Novuhair on her scalp and it seems like there are new hair sprouting on it. We trust TF! LOL!